Walk Everywhere In Town From This Charming, Convenient Remodeled Studio Loft. Property 4: Walk Everywhere In Town From This Charming, Convenient Remodeled Studio Loft. Property 5: NEW! Ouray Condo w/Patio 1/2 Block to Main Street! Stunning Ski-in Ski-Out Condo On River Trail w/Ski & Mtn Views ,7th Night FREE! Property 7: Stunning Ski-in Ski-Out Condo On River Trail w/Ski & Mtn Views ,7th Night FREE! Right On Main St In Telluride Town. Walk Everywhere! Property 10: Right On Main St In Telluride Town. Walk Everywhere! Property 14: Walk To Ouray Hot Springs Pool, The Sneffels Suite Has Everything You Need! Newly renovated, views to Town Park and all the Festivals that happens there! Property 21: Newly renovated, views to Town Park and all the Festivals that happens there! NEW! Viking Lodge 213. Steps To Skiing, 5 Mins Walk to Main St & Gondola. Pool, Hot Tub, Parking. Property 23: NEW! Viking Lodge 213. Steps To Skiing, 5 Mins Walk to Main St & Gondola. Pool, Hot Tub, Parking. Beautifully Remodeled Fall Line 210, Private Balcony, Covered Parking. Prime Downtown! Property 29: Beautifully Remodeled Fall Line 210, Private Balcony, Covered Parking. Prime Downtown! Now Available !!! In Town Newly Remodeled Studio! Property 32: Now Available !!! In Town Newly Remodeled Studio! Unbelievable Views, Adjacent to Park, Hot tub on Site and oh so close to the San Miguel River! Property 33: Unbelievable Views, Adjacent to Park, Hot tub on Site and oh so close to the San Miguel River! Enjoy Our Lovely Remodeled, Riverfront Condo In Telluride Town. Pool, Hot Tub. Property 36: Enjoy Our Lovely Remodeled, Riverfront Condo In Telluride Town. Pool, Hot Tub. Town Park Pond, Ajax Peak and Box Canyon Views! Property 38: Town Park Pond, Ajax Peak and Box Canyon Views! Property 43: Madison Pacific Town Home-Massive One Bedroom with southern exposure and a fireplace! Amazing Grace - Viking Lodge 210 In Telluride Town, Private Balcony, River & Ski Area Views! Property 44: Amazing Grace - Viking Lodge 210 In Telluride Town, Private Balcony, River & Ski Area Views! Property 45: UPDATED! WALK-OUT PATIO ADJ TO RIVER TRL, #112, HOT TUB/POOL, VIEWS! A JOY! Charming Studio with private balcony! Property 48: Charming Studio with private balcony! Property 49: Telluride Lodge 526 - A True Mountain Retreat In Beautiful Telluride Town. 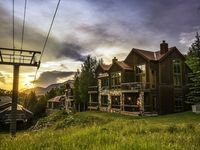 Perfect location for our family with young kids to access ski lifts and slopes for their beginner to intermediate skill levels, sledding right outside the door, and steps from the chondola to get to Telluride town. You can't beat the location!